Swaths of public land in the California desert will be opened to solar and wind farms under a federal plan released Wednesday that preserves much of the landscape for conservation and recreation. The long-awaited blueprint finalized by the U.S. Interior Department after a years-long process seeks to balance renewable energy development and species protection on 17,000 square miles of desert managed by the federal government. The California desert — a mix of sand dunes, jagged canyons and colorful rock formations — stretches 350 miles from Owens Valley east of the Sierra Nevada to near the Mexican border. Home to the threatened desert tortoise, bighorn sheep and other animals, its vastness and ample sunshine make it an attractive hotspot for sprawling solar, wind and geothermal plants. The plan would allow construction on 606 square miles of public land away from ecologically sensitive habitats. Developers who propose projects in the zone would get preferential treatment. Another 717 square miles would also be potentially open to clean-energy development, but companies would have to jump over more hurdles to get projects approved. The majority of federal desert land would be off-limits to development, with government land managers designating 10,200 square miles for conservation and 5,617 square miles for recreation. Environmental groups generally supported the plan, saying it safeguards scenic desert vistas and corridors that allow animals to move within their habitat. "We can have a strong clean-energy economy while protecting nature," said Erica Brand of the Nature Conservancy. The renewable energy industry disagreed, warning the plan would severely limit development. The federal government "missed a golden opportunity," Tom Kimbis, acting president of the Solar Energy Industries Association said in a statement. "This plan permanently locks up some of our greatest untapped solar and wind resources, and chooses regulation over innovation and progress." Wind energy advocates said the dozen wind projects under construction on public land when the plan was being formed are now defunct and many developers have fled the state. "This plan will largely end wind energy development in California," Nancy Rader, executive director of the California Wind Energy Association, said in a statement. 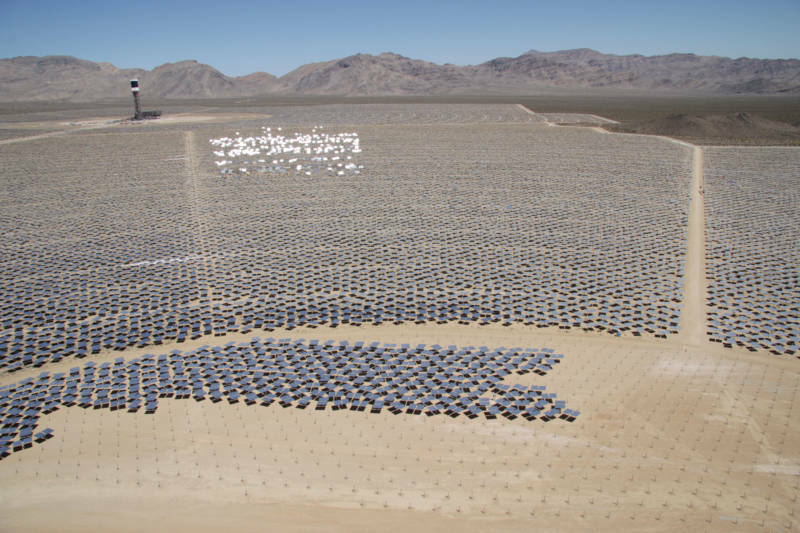 The tension between the renewable energy industry and conservation groups was highlighted in the development of the Ivanpah solar plant, which opened in 2014 on roughly 5 square miles of federal land near the California-Nevada border. An environmental group unsuccessfully sued the federal government in an attempt to stop construction that displaced desert tortoises. In the end, the developers spent more than $20 million to relocate the animals. The rush to the desert comes amid ambitious climate goals set by the federal government and the state. California is on track to meet a state goal of having a third of its energy come from renewable sources by 2020. It recently set a higher bar to generate half of its electricity from the sun, wind or geothermal power by 2030. President Barack Obama has called on the Interior Department to approve renewable energy projects that generate 20,000 megawatts of power on public land by 2020. Since 2009, the department has signed off on 59 large-scale renewable energy projects on federal land in the West including 35 solar plants, 11 wind farms and 13 geothermal projects. State and federal officials said the newly carved California development zone should help reach both goals. Work on the plan began in 2008 during a time when developers armed with government subsidies were eyeing the Mojave Desert and elsewhere to erect solar panels and wind turbines. State and federal energy and wildlife agencies tasked with creating the road map consulted with environmentalists, developers, scientists, American Indian tribes and others. A draft plan was released in 2014 covering 22 million acres of public and private land that sought to bring order to the green building boom. Planners decided to tackle the public land portion first and are currently working with several counties to pinpoint private desert land suitable for clean-energy projects and other areas for conservation. The Center for Biological Diversity called the latest plan a positive step but said it doesn't do enough to conserve wildlife habitat. The lands eyed for development are either already disturbed or considered less valuable from an ecological perspective. By confining the renewable energy industry to regions that are less controversial, land managers said companies should have an easier time pushing projects through while facing less resistance from environmental groups. "This gives more certainty" to developers, said Jerry Perez, state director of the U.S. Bureau of Land Management, adding that companies will still have to get permits and do environmental reviews.